Spoof news: Who is, or was, the greatest martial artist in history? Who is, or was, the greatest martial artist in history? This is Dr. Jackass & Mr. Hide when he was a young whippersnapper. I only got to the rank of 2nd degree black belt in Chinese & American Kenpo, so I am certainly no expert. I earned all my higher belts at American Karate Studios in Northeastern Ohio, and was a competitor on the PKC circuit for over a decade and 20 years later, in which I've taken a lot of "staycations" without much in the way of 'stay at home time', I am considering returning to teach kata and play around with some weapons like tonfas, the bo staff, nunchucks, throwing stars, while giving poor kids schoolbags and that sort of smoke-and-mirrors stuff. I’m trying to get back with my old sensei, who is a grand master now, but it might be a tough sell after I posted all those horrid anti-Chuck Norris memes on my Facebook page. To boot, my grand master is a big fan and even most likely a personal friend of Chuck Norris. Ouch! That hoits! He might even be one of Grand Master Norris's relatives. And there is a wide assortment of school bags right here.. Although it might just look like a dance, this kata kung-fu instructor does a killer kata right here called "Four Winds" which also has a derivative in Kenpo. And here's another black belt instructor doing "Four Winds" to Tai Chi. Your girlfriend might want to try to do this thing after studying it for a while. Then if she continuously does it quicker and quicker, she's not only a dancer, but a martial artist! You can view all sorts of katas by calling them up on YouTube. My faves are all slugged Open Hand Kata Kenpo or Weapons Kata Kenpo. Most of my karate trophies, PKC points and big-time plaques and awards came because I placed so well in weapons and regular kata, or take yoga and fast track it about 199 times to the nth power. That’s how black belt kata looks, anyhow. But I won a great number fighting. My fave is from the Toledo Whirlwind tourney, oh, about 25 years ago, in which the face of the trophy has processed silver adorned with red, white & blue! Another fave is from a father who lost his oldest son in a hideous car wreck when the boy was still in high school. The son was the father's good pal and fellow instructor. I have a first and third place trophies from this annual, held in Canton, Ohio, on two separate years. The first place trophy has a front of fake gold with an inlay for the incidentals. The other is mother of pearl, with print for all pertinent information regarding this tourney and how I placed. This one was third place, the other stands about four feet tall and is much more exotic and beautiful. So I will just throw a few names around and let you yell down a barrel if you don’t like the options I’m giving you. You have every right to call me horrible names and yell at my profile pics. I’m a freelance journalist these days. Back when I was younger, I was working for print mags that actually paid pretty good dinero’ for print submissions. I was paid well and my instructor gave me clothing from the fancy men's department store in the best mall in Northeastern Ohio when I was a roaming and roving reporter. I was the best looking reporter in town, and even had hair longer than the girls on TV. Yeppers, NDN men never cut their hair even if somebody threatens them with a baseball bat. Bruce Lee – He was so quick with his hands that the camera had to be slowed down so people could actually only see a blur, otherwise, it would like as if The Bruce was just standing there or was being held in thin air like an exorcist’s nightmare from hell. They said when Chuck Norris and Bruce Lee fought, it was the greatest kumite match in the history of the world. Watch Enter the Dragon to see more. . .
A friend of mine, Roy Paris, and I were discussing this subject recently in a funked out hotel in Ohio Valley Appalachia and we came to the conclusion that nobody really knows how Bruce Lee died. Could he have swallowed packets of narcotics and there was a leak in a small packet? Did he actually run into a martial artist that's a lot bigger and badder than even him? Or did he discover Megaladon in the megalomania of skinny dipping in the North Sea off the Cliffs of Dover? Who knows? Jackie Chan - He looks to be every bit of 44, but he's older. Much older. There is some agreement that Bruce Lee never died, but instead, Jackie Chan is the real McCoy older version of the young Asian renegade. Who is crazy and funny enough to fly from the dangling rope of a helicopter or a jet plane while laughing all the way? Jackie Chan, of course....And who is there to save the day when a long, lost relative, Charlie Chan, the Asian chop suey to youey chef loses money during a bank hijack robbery? A furious and lethal Jackie Chan, of course!.. We haven't seen any good Jackie Chan movies lately. Maybe the great Grand-Grand-Grand-Grand Master finally did retire. Or maybe he's competing in a host of karate tournaments sticking to the role of a drunk monkey competitor in forms and fighting. Chuck Norris – He’s bad. Yep, really bad. But he has a pure and solid soul, but just stay on the right side of the law, all you rogues and renegades. And it is noted that he brought karate to the Americas, yes, he was one of the first advisors over there in Vietnam and is today a tough and sweet 70-year-old who does all he can to promote and explain the Yin and the Yan. Although they already have sundances on the High Plains for NDNs, along with almost every other nation, tribe and band in North America. And in Mexico, they have other sorts of stuff that’s just as pretty, but can be downright scary if you happen upon an unassuming practitioner late at night or early in the morning. But for anyone in trouble. that individual who is now a stardancer or a moondancer may just be your guardian angel some dark, rainy and dreary night. Yes, they call it dance, we call it kata. A first cousin who clocked in about a baker's dozen years before I was catapulted to earth was a cop; yeah, really, and he was my first karate instructor when I was a mere kid. He died a couple years ago. We all miss him. He had his ways, but overall, he was a good soul. And he got me out of a lot of jackpots. And yes, he was an enlisted U.S. Navy man during the days of Vietnam and yes, he really admired and loved Chuck Norris, too. Ouch! That hoits! And no, he’s not a seagull but he certainly fights like one that you just snagged a treat from on a hot July day in the bloody north asphalt of a shopping plaza. Seagal is a great martial artist and like Chuck Norris, he is a lawman. Come to think of it, since Saint Michael the Archangel is the patron saint of all cop types, well..., count Norris & Seagal in, too. Oh, and by the way, both of these fantastic karate practitioners also starred in war movies. I used to like them back in the day but after discovering Army ROTC was not my cup of tea at Rubber City A & E, I just studied liberal arts. I think it was a great move. A young man called me "Sir" after a community event had ended last night. I sort of ordered him never to call me "Sir". I informed him I quit being a "Sir" when I was in my early 20's. Steven rides around Louisiana’s parishes with sundry police and sheriff departments looking for bad guys. He’s made a lot of great movies that I truly enjoy and his martial arts skills are impeccable and extremely compelling. He's like Mad Max on steroids, and double fry that Sylvester Stallone creep in bacon grease. Oh, I come up with such corny one-liners. Word has it that Steven studied the martial arts ever since he was a mere child and that he had both instructors on the Ying and Yang side of the circle; but these days, I guess he’s doing all he can to stay in the white and out of the dark; although police usually find their most violent predators and attackers late at night. Although I haven't seen his latest movie yet, something about some poor sot being kidnapped and thrown into some batshit crazy concentration camp, since I have had the "pleasure" of spending both the Christmas Holidays right up to the Easter Holidays in one myself, I'm not laughing all that hard. But perhaps in a year or so, I will decide to watch the movie. The physical histrionics look to be very compelling, as well as the acting, and pieces of the teasers I've seen on TV over the winter look to be downright fall-off-your-lawn-chair funny! He's a great martial artist, a comedian and an actor deserving the "character actor role" and not just some thug or crystal twinky Samurai, so sure, Jean-Claude Van Damme gets my nod as the fifth of the greats. And there will be a cap to the story here with him. Sure, there are others, enough probably to build a library around. And in your own town or city, there are several high-ranking black belts. But I don't have the means nor the wherewithal to visit every major city, medium-sized city and town across the way. 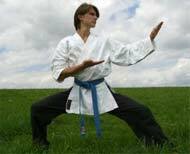 And there are very good karate schools in rural areas. The thing I like the most about Van-Damme is that he makes the martial arts fun. And Sylvester Stallone is a great boxer, I really loved the first Rocky movie and most that followed, but that little stunt he pulled with that teenage girl and one of his cronies makes most of us sick. Anyhow, Van-Damme is a funny guy and is particularly a hit with the teenage crowd around the world. So there you have it. If you have children or teens, send him and her to a karate school and cheer them on when they go to tournaments as a karate team. If you are a middle-aged accountant and are getting tired of getting fat by watching all those basketball and hockey games at all the sports bars around town, some type of martial arts system and a good group of instructors will custom fit you for your next date with Ms. Wonderful. And ditto for Ms. Wonderful who'd like to meet a Mr. Wonderful for a change. You’re never too old or young to learn karate, and this old man is getting his strong heart back, as well as a stronger back and tougher arms and legs, so I plan to join the ranks of the pastel and primary color belts very soon. My great great great great grandmammy might’ve been an Irish princess - she might have been, I’ve been told by members of my family who are in the know. But I’m primarily just a mongrel – Slovak and NDN. So never take your eyes off a leprechaun, since she’ll stag those tonfas right out of your hands and hit you with them right around he ears.